A fan’s forum post provoked Bashiok into a rare event; the reveal of a new Witch Doctor skill. A blowgun that you can buy different kinds of darts and also have different blowgun skills like a rapid shot and critical shot. Bashiok: Wow, pretty good guess. We have a new witch doctor skill called Poison Dart. Pretty much this. 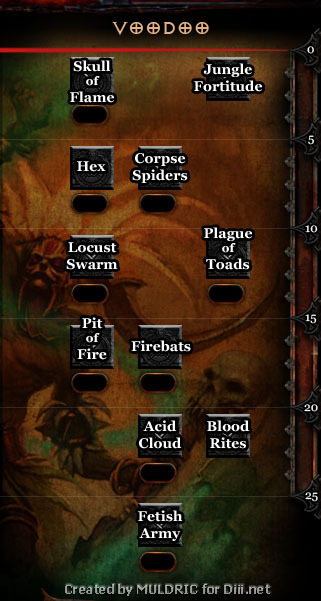 We saw 34 Witch Doctor Skills at last year’s BlizzCon, and nothing like Poison Dart was among them. There’s no telling where it is in the skill tree, now that the 3 skill trees have been combined/reformed, but this would clearly have been in with the Voodoo Skills, where all of the direct attack, mage-like spells are were located. Most (all?) of the WD spells available for use at BlizzCon last year were fairly slow-acting. Skull of Flame has to be thrown across the screen. Corpse Spiders and Locust Swarm have to swarm/crawl over the enemy. Plague of Toads have to hop their way there, Charged Bolt style. Fire Bats deal DoT, like Inferno. With magical attacks like those, something like Poison Dart, that shoots out a lot of quick poisoned projectiles, would be very useful, to mix up the speed of damage delivery and aid in nailing fast-moving enemies. It’ll be interesting to find out if this is a low, medium, or high level spell. A BB-gun, or a boss-killer? Personally, I envision it as a low/mid-level ability. I picture it quickly dealing draining poison damage, potentially to a number of targets, kind of like Strafe crossed with Teeth. The sort of attack that you’d use on lots of small enemies, to offset their health regen right at the start of a battle. Rather than some kind of mega killing attack that works against bosses.